Octavo, a monthly magazine, is the voice of the Stour Vale Parishes, being packed with news from all seven parishes, eight villages – both church and village items of interest. It also has news from Stower Provost School and a children’s page. It is published on the last Friday of each month and costs 60p a copy. 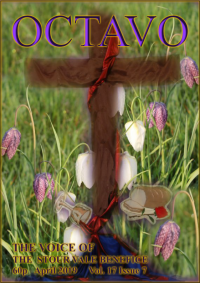 Copies can be found for sale in all of the churches in the Stour Vale Benefice. Click Here for this month’s Letter from the Vicar, Thought for the Month, Prayer for the Month and additional service information. Buckhorn Weston; East Stour; Fifehead Magdalen; Kington Magna; Stour Provost; Stour Row; Todber; West Stour. Collaters: meet a couple of days before publication to put it together. Collation date is on a Monday between copy date and publication.